Posted on 2 January 2017 under Guest Editorials, Pacifism, Theory. Giotto, “St. 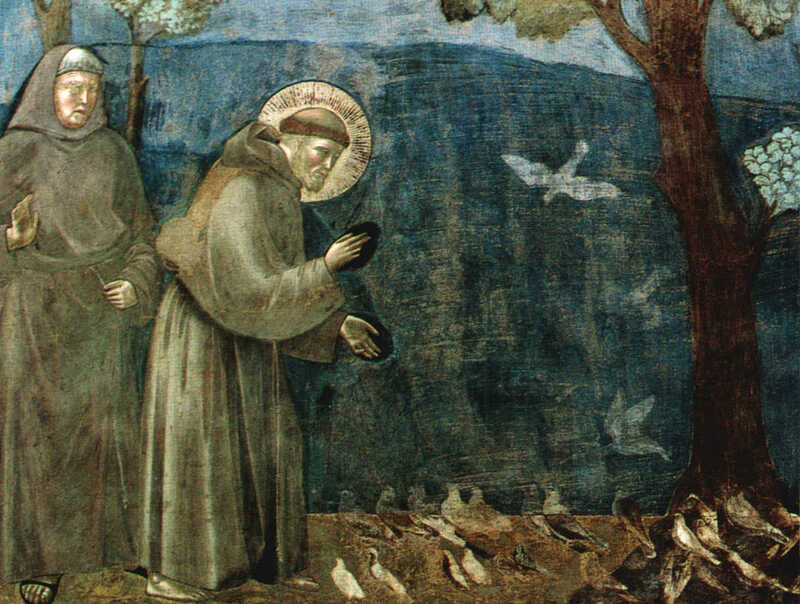 Francis Preaching to the Birds”; courtesy jssincivita.com. 1. At the beginning of this New Year, I offer heartfelt wishes of peace to the world’s peoples and nations, to heads of state and government, and to religious, civic and community leaders. I wish peace to every man, woman and child, and I pray that the image and likeness of God in each person will enable us to acknowledge one another as sacred gifts endowed with immense dignity. Especially in situations of conflict, let us respect this, our “deepest dignity”, (1) and make active nonviolence our way of life. May nonviolence become the hallmark of our decisions, our relationships and our actions, and indeed of political life in all its forms. On this occasion, I would like to reflect on nonviolence as a style of politics for peace. I ask God to help all of us to cultivate nonviolence in our most personal thoughts and values. May charity and nonviolence govern how we treat each other as individuals, within society and in international life. When victims of violence are able to resist the temptation to retaliate, they become the most credible promoters of nonviolent peacemaking. In the most local and ordinary situations and in the international order, may nonviolence become the hallmark of our decisions, our relationships and our actions, and indeed of political life in all its forms. 2. While the last century knew the devastation of two deadly World Wars, the threat of nuclear war and a great number of other conflicts, today, sadly, we find ourselves engaged in a horrifying world war fought piecemeal. It is not easy to know if our world is presently more or less violent than in the past, or to know whether modern means of communications and greater mobility have made us more aware of violence, or, on the other hand, increasingly inured to it. In any case, we know that this “piecemeal” violence, of different kinds and levels, causes great suffering: wars in different countries and continents; terrorism, organised crime and unforeseen acts of violence; the abuses suffered by migrants and victims of human trafficking; and the devastation of the environment. Where does this lead? Can violence achieve any goal of lasting value? Or does it merely lead to retaliation and a cycle of deadly conflicts that benefit only a few “warlords”? Violence is not the cure for our broken world. Countering violence with violence leads at best to forced migrations and enormous suffering, because vast amounts of resources are diverted to military ends and away from the everyday needs of young people, families experiencing hardship, the elderly, the infirm and the great majority of people in our world. At worst, it can lead to the death, physical and spiritual, of many people, if not of all. 4. Nonviolence is sometimes taken to mean surrender, lack of involvement and passivity, but this is not the case. When Mother Teresa received the Nobel Peace Prize in 1979, she clearly stated her own message of active nonviolence: “We in our family don’t need bombs and guns, to destroy to bring peace – just get together, love one another… And we will be able to overcome all the evil that is in the world.” (7) For the force of arms is deceptive. “While weapons traffickers do their work, there are poor peacemakers who give their lives to help one person, then another and another and another”; for such peacemakers, Mother Teresa is “a symbol, an icon of our times.” (8) Last September, I had the great joy of proclaiming her a Saint. I praised her readiness to make herself available for everyone “through her welcome and defence of human life, those unborn and those abandoned and discarded… She bowed down before those who were spent, left to die on the side of the road, seeing in them their God-given dignity; she made her voice heard before the powers of this world, so that they might recognise their guilt for the crimes – the crimes! – of poverty they created.” (9) In response, her mission – and she stands for thousands, even millions of persons – was to reach out to the suffering, with generous dedication, touching and binding up every wounded body, healing every broken life. The decisive and consistent practice of nonviolence has produced impressive results. The achievements of Mahatma Gandhi and Khan Abdul Ghaffar Khan in the liberation of India, and of Dr Martin Luther King Jr in combating racial discrimination will never be forgotten. Women in particular are often leaders of nonviolence, as for example, was Leymah Gbowee and the thousands of Liberian women, who organised pray-ins and nonviolent protest that resulted in high-level peace talks to end the second civil war in Liberia. 5. If violence has its source in the human heart, then it is fundamental that nonviolence be practised before all else within families. This is part of that joy of love, which I described last March in my Exhortation Amoris Laetitia, in the wake of two years of reflection by the Church on marriage and the family. The family is the indispensable crucible in which spouses, parents and children, brothers and sisters, learn to communicate and to show generous concern for one another, and in which frictions and even conflicts have to be resolved not by force but by dialogue, respect, concern for the good of the other, mercy and forgiveness. (16) From within families, the joy of love spills out into the world and radiates to the whole of society. (17) An ethics of fraternity and peaceful coexistence between individuals and among peoples cannot be based on the logic of fear, violence and closed-mindedness, but on responsibility, respect and sincere dialogue. Hence, I plead for disarmament and for the prohibition and abolition of nuclear weapons: nuclear deterrence and the threat of mutual assured destruction are incapable of grounding such an ethics. (18) I plead with equal urgency for an end to domestic violence and to the abuse of women and children. 6. Peace-building through active nonviolence is the natural and necessary complement to the Church’s continuing efforts to limit the use of force by the application of moral norms; she does so by her participation in the work of international institutions and through the competent contribution made by so many Christians to the drafting of legislation at all levels. Jesus himself offers a “manual” for this strategy of peacemaking in the Sermon on the Mount. The eight Beatitudes (cf. Mt 5:3-10) provide a portrait of the person we could describe as blessed, good and authentic. Blessed are the meek, Jesus tells us, the merciful and the peacemakers, those who are pure in heart, and those who hunger and thirst for justice. I pledge the assistance of the Church in every effort to build peace through active and creative nonviolence. On 1 January 2017, the new Dicastery for Promoting Integral Human Development will begin its work. It will help the Church to promote in an ever more effective way “the inestimable goods of justice, peace, and the care of creation” and concern for “migrants, those in need, the sick, the excluded and marginalised, the imprisoned and the unemployed, as well as victims of armed conflict, natural disasters, and all forms of slavery and torture.” (23) Every such response, however modest, helps to build a world free of violence, the first step towards justice and peace. 7. As is traditional, I am signing this Message on 8 December, the Solemnity of the Immaculate Conception of the Blessed Virgin Mary. Mary is the Queen of Peace. At the birth of her Son, the angels gave glory to God and wished peace on earth to men and women of good will (cf. Lk 2:14). Let us pray for her guidance. (1) Apostolic Exhortation Evangelii Gaudium, 228. (2) Paul VI, Message for the First World Day of Peace, 1 January 1968. (3) “The Legend of the Three Companions”, Fonti Francescane, No. 1469. (4) Benedict XVI, Angelus, 18 February 2007. (7) Mother Teresa, Nobel Lecture, 11 December 1979. (8) Meditation, “The Road of Peace”, Chapel of the Domus Sanctae Marthae, 19 November 2015. (9) Homily for the Canonization of Mother Teresa of Calcutta, 4 September 2016. (12) Address to Representatives of Different Religions, 3 November 2016. (13) Address to the Third World Meeting of Popular Movements, 5 November 2016. (14) Cf. Address at the Interreligious Meeting with the Sheikh of the Muslims of the Caucasus and Representatives of Different Religious Communities, Baku, 2 October 2016. (15) Address in Assisi, 20 October 2016. (16) Cf. Post-Synodal Apostolic Exhortation Amoris Laetitia, 90-130. (17) Cf. ibid., 133, 194, 234. (18) Cf. Message for the Conference on the Humanitarian Impact of Nuclear Weapons, 7 December 2014. (19) Encyclical Laudato Si’, 230. (20) Apostolic Exhortation Evangelii Gaudium, 227. (21) Cf. Encyclical Laudato Si’, 16, 117, 138. (22) Apostolic Exhortation Evangelii Gaudium, 228. (23) Apostolic Letter issued Motu Proprio instituting the Dicastery for Promoting Integral Human Development, 17 August 2016. (24) Regina Coeli, Bethlehem, 25 May 2014. (25) Appeal, Assisi, 20 September 2016. EDITOR’S NOTE: The statement by Pope Francis is courtesy of the Pontifical Council for Justice and Peace, www.iustitiaetpax.va. Help us meet our expenses. Even the smallest donation is appreciated. To stay informed of new articles, please click here.